The complete handcrafted Nativity Scenes and Sets catalogue of the historic Francesco Pellegrini workshop. Our statues and statuettes with the Nativity figures and characters are ideal for decoration and display in homes, churches, parishes and public places worldwide. The treatment of the statues allows the indoor and outdoor positioning. The nativity scene classic characters, figurines, animals and ornaments are original pieces made of plastic PVC or Oxolite Resin and are available in 11 sizes, from the miniature small size cm 4 (1,6 inch) to the large size scale cm 100 (39,4 inch). All figures, in traditional Italian style, are the work of Elio Simonetti, Paolo Tessaro and other master sculptors, and are painted by hand by the master craftsmen of Bagni di Lucca (Italy). 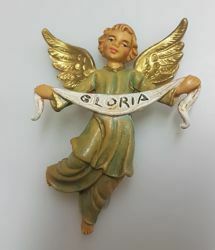 Inexpensive collectible statues and figures for Nativity Scenes, with excellent quality/price ratio. 100% Made in Italy.